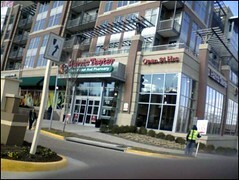 The city’s newest grocery store opens tonight at 5:30. The Harris Teeter at Constitution Square (1201 First Street NE, near the NY Ave Metro) will throw open its doors for everyone and host a two and a half hour “Taste of the Teeter” event so you can try most of the stuff in the store. I’m pretty excited about this opening, since it’s right in my backyard, and will probably become my everyday grocery store. Though the store isn’t a 24-hour grocery, which is a bummer, it’ll be open from 7a to midnight each night, and features a pharmacy department open 7 days a week as well. See you at the opening! Wait, it’s right in my backyard. It will become my everyday (and I might mean that literally) grocery store. Are you me? I don’t really understand why a CVS is moving in across the street, but I guess there are enough people to go around.